Light your BBQ and wait until the coals are white or until the temperature of your gas unit is maxed out. Season the steak with Sea Salt and Cracked black pepper and place on the grill. As there is little fat content in a fillet steak you want to serve it at the very least medium rare, but rare is always my preference. Use a meat thermometer and cook the steak until an internal temperature of 55 for rare or 60 for medium rare which shouldn't take any longer than around 2/3 minutes per side for a 1 inch thick steak. I used a Chateaubriand in the pic below which took slightly longer but again a meat thermometer is the way to go. Once cooked remove the steak and let it rest while you prepare the salad. In a preheated pan add the chorizo with a tablespoon of oil. Within a couple of minutes you will see the chorizo start to release its oils which will be the base for your dressing. Fry the chorizo until the edges start to crisp then add the crushed garlic. This is were you have to watch the garlic like a hawk. As soon as it starts to take on colour after around 15 seconds quickly add the lemon juice to stop it from cooking any further. Add the remainder of the oil along with a teaspoon of pepper and your dressing is complete. For the Salad simply cut the lettuce, cherry tomatoes and red onion and place in your serving dish then grate the Parmesan and mix well. 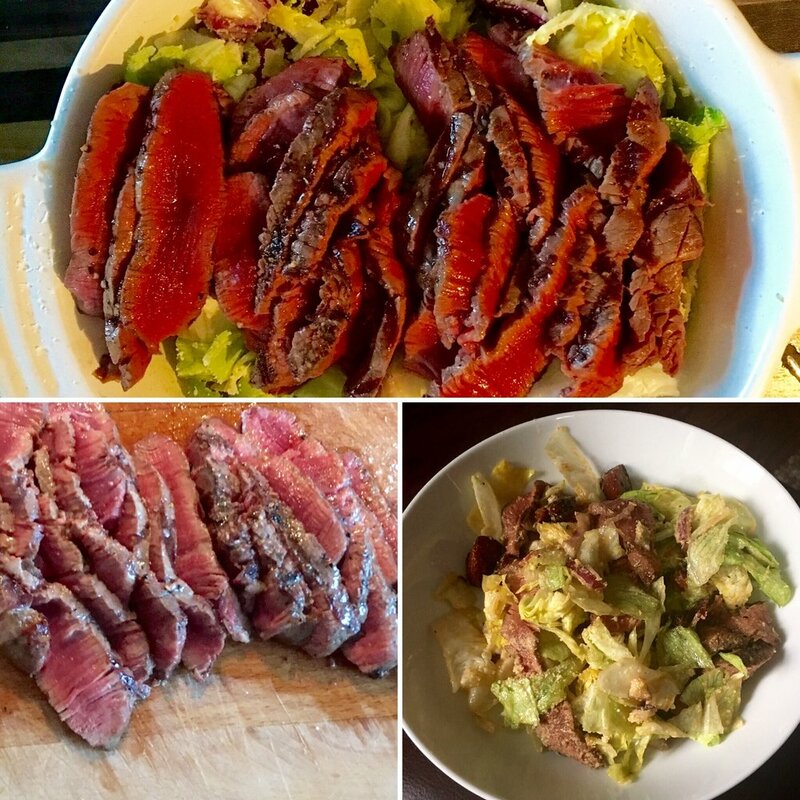 Dress the salad with the lemony dressing and place the finely sliced steak on top!